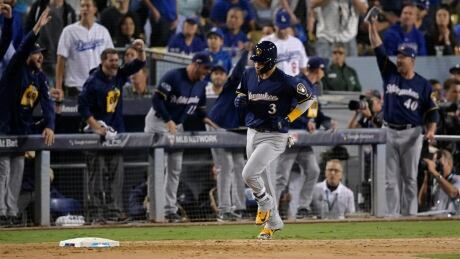 Jhoulys Chacin combined with four relievers on a five-hitter, Orlando Arcia hit a two-run homer and the Milwaukee Brewers beat the Los Angeles Dodgers 4-0 on Monday to take a 2-1 lead in the NL Championship Series. Game 4 in the best-of-seven series is Tuesday night at Dodger Stadium, with left-hander Rich Hill pitching for Los Angeles. The Brewers had yet to announce a starter. Chacin scattered three hits over 5 1/3 innings.